Despite the enormous progress, both politically and economically, freedom of press continues to be a point of contention in Southeast Asia. It remains restrictive and is typically heavily influenced or controlled by the respective governments in countries within the region. The lack of press freedom in ASEAN countries continues to be a growing concern – especially with the recent and infamous press crackdown of Cambodia Daily in Phnom Penh, Cambodia. 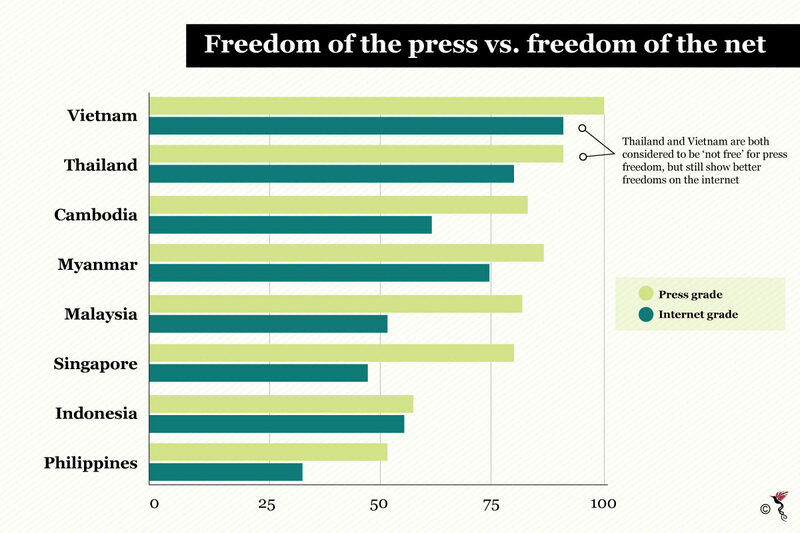 According to Freedom House, a US-based independent watchdog, ASEAN nations are either “not free” or “partly free” in terms of press freedom, based on the index it employs. Heavy repression by authorities restrict the flow of news and information, resulting in the dissemination of tailored content and propaganda to society at large. This then gives way to the conundrum and the rise of “fake news” through the utilisation of freedom of the net, as individuals and society seek to counter these efforts but do so with a lack of finesse or malicious intent in their pursuit to have a voice. 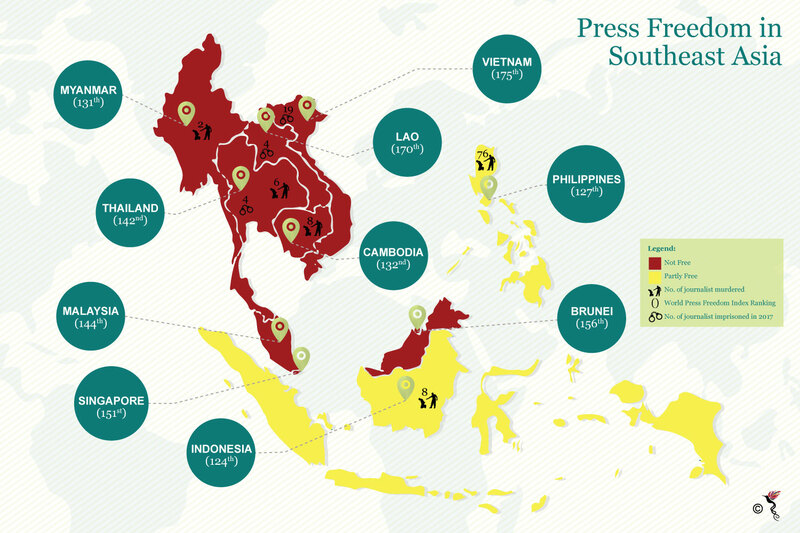 Press freedom ranking in Southeast Asia. “So, governments must be called to account for this because it is unethical, and in many cases, corrupt." 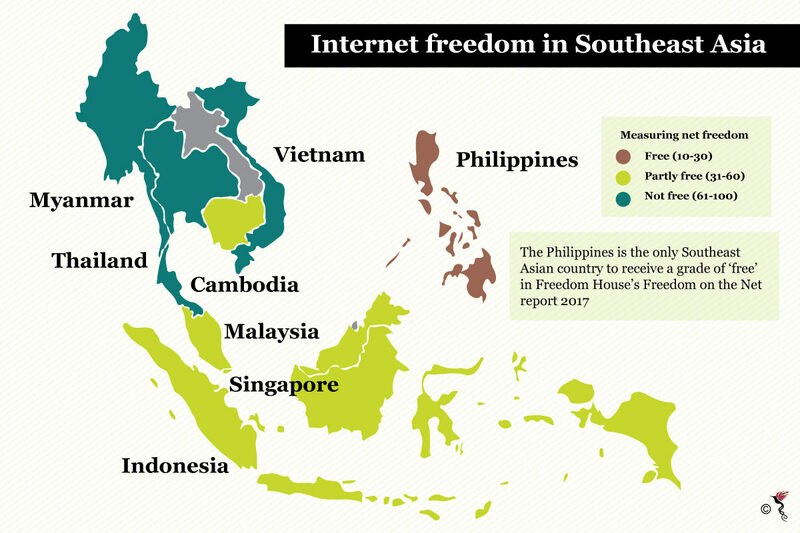 Internet freedom ranking in Southeast Asia. Freedom House has recently published their annual Freedom on the Net 2017 report in which they assess internet access and online censorship of 65 countries from around the world. In general, the trend leaned towards more countries using fake news to manipulate online content and within Southeast Asia there was only one country that came out with a ‘free’ grade – Philippines. One of the larger concerns based on the findings is that although most countries in the region have high internet penetration levels, which has led to an increase in the amount of information shared and exchanged, this flood has also diluted the reliability and credibility of information. ASEAN, given its massive digital footprint, must act fast to curb the spread of disinformation. Freedom of press versus freedom of the net. Based on the report, the Philippines was said to be among 30 countries where governments were found to employ armies of “opinion shapers” to spread government views, drive particular agendas, and counter government critics on social media through the freedom of the net. Unlike more direct methods of censorship, such as website blocking, online content manipulation is difficult to detect. It is also more difficult to tackle, given its scattered nature and the number of people and bots employed for this purpose. “While restrictive laws can be difficult to change in the short run, the media can improve their ethical standards in reporting by practicing self-regulation to address incidents of misreporting and unethical practices. The public knows if certain media are not acting professionally, so the press must do its part to gain the public's trust,” explained Edgardo.